It’s funny how information pops out the woodwork when people find out you have an interest in shipyards! A close friend of mine entrusted one of her family treasures to me for a few weeks, and although it is not directly related to the yard, I thought a wee review might be in order. The author begins by pointing out that today, one would be hard pressed to realist that Kingston and Garmouth were once the centre of a thriving shipbuilding industry only 200 years ago, which flourished until the early 20th century. The first chapter concentrates mainly on the geography of Speymouth, its river and villages. Chapter two tells some of the early history of Garmouth including its encounter with Charles II. 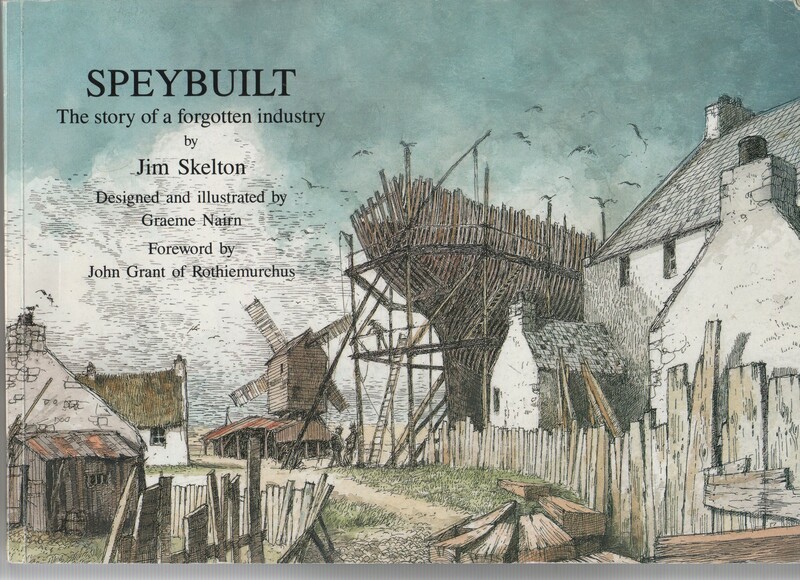 We also learn that the first sale and floating of Spey timber was in 1630; a smallpox epidemic wiped out 112 of the population of Speymouth Parish in 1741-2; the increase in demand was sufficient for two sawmills to be erected in 1750; that a shipbuilding increased a 127 ton brig “Industry” and a 75 ton sloop “Britannia” were amongst the early larger ships ; that a navigable canal had to be maintained to enable vessels to approach Kingston with the high tide; Thomas Telford built the Craigellachie Bridge at Fochabers in 1814 which was partly destroyed in the “Muckle Spate” of 30th August 1829; by 1838 the tonnage launched had reached nearly 1000 tons; in 1867 it peaked at over 3000 tons; as the community grew Garmouth Sabbath school opened in 1822; a gasworks began operation in 1857; the numbers of skilled labourers such as shipwrights, carpenters, blacksmiths, blockmakers, sawmillers and sawyers increased steadily; the coastguard established a presence by 1881; the “Admiral”, Scotland’s first vessel fitted for gutting at sea in all weathers and the largest smack in Scotland at 86’ long with a beam of 22’6” was launched in 1883 by James Duncan of Kingston; the last large ship to be launched at Speymouth in 1890, was the “Janet Storm”, a 115 ton schooner from the yard of J. Geddie; Geddie’s yard was bought in 1906 and machinery installed to build steam drifters and “Rosedale”, “Handsome”, “Winsome” and Blythsome” were launched in 1907 and 8. Chapter three extols the virtues of Pinus Sylvestris, Scots Pine or Fir. It explains how the demand for oak by shipbuilders made it progressively more scarce and expensive and an alternative was needed. Thus began a long series of contracts with landowners to supply the newly discovered commodity. After the Jacobite Rebellion of 1715 various estates forfeited by the leading rebels changed hands. Those utilising the forests built up the infrastructure to bring the wood out, making roads through the woods, erecting proper sawmills, even cutting a passage through a rock in Spey without which floating would not have been possible. In 1780 the Duke of Gordon tried to prevent Sir Ludovic Grant from floating timber down the river to Garmouth as it sometimes destroyed his fishing braes, but the fact that York Building Company had floated timber since 1728 and Captain John Mason since 1630 meant the floating was allowed to continue. A more recent re-enlivening of this challenge occurred in 1977 when the proprietors of several of the fishings on Speyside tried to prevent Clive Freshwater of the Cairngorm Canoeing and Sailing School from canoeing the length of the Spey, and as in 1781 the historic precedents held sway. We also learn of the plank from the “Maiden Tree of Glenmore” just inside the entrance of the Forestry Department of Aberdeen University which is reckoned to have been some 260 years old and 19 feet in girth at the bottom. It has survived due to the resinous nature of mature fir trees, a quality not achieved in more recent years as proprietors could not afford to wait so long for the trees to mature. There is too much detail to abbreviate here, but anyone seeking good detailed knowledge of the local timber trade would do well starting here. Chapter four covers the ships and shipbuilders from 1784 to 1807. The Glenmore Company, Dodsworth and Osborne or The English Company established operations in 1784 and quickly set up a dockyard and facilities to store and mill timber and build and launch ships. The port they established was first called Kingston Port after the company’s port of origin – Kingston Upon Hull. In 1787 Leslie and Co began building ships at Kingston Port with the “Industry” which was mentioned above. Logie began shipbuilding with the “Britannia”; a Mr Robertson with the “Two Sisters” of 48 tons and the “William” of 60 tons; a Mr Falconer produced the “Isabella” at 46 tons and ships built at other ports including Peterhead, Hastings and Shoreham were described as being of Spey fir or Spey timber. The only Speyside ship the author has discovered which carried guns was the “Abraham Newlands” of 1805. The Osborne’s era ended in 1806 when their Glenmore Forest contract ended and their right of tenure at Kingston expired. Chapter five takes up the story of the ships and shipbuilders from 1808 – 1809. After the cessation of business by Osborne and Co there was a lull in shipbuilding, Skelton conjectures that this could be due to a slump in demand after the victory at Trafalgar gave Britain mastery of the seas. Then in 1814 William Geddie, a former Osborne employee began building on his own account with the “Five Friends”, a 67 ton sloop from the disused Osborne yard north of Red Corff House from where members of the Geddie family would continue shipbuilding until the late 1880s. In 1822 James Winchester began building with a 58 ton sloops “Lady Jane”. Launchings were spasmodic over this period, and another builder, Alexander Leslie whose first ship was the sloop John Barrie” appeared in 1835. From this time, the tonnage launched began to steadily increase and in 1840 another builder, John Duncan, who was to be one of the most prolific producers of ships began with the 75 ton schooner “Highlander”. In 1855 two more builders, John Badenoch who commenced with the 107 ton schooner “Johns” and Alexander Young whose first was a 134 ton schooner “Venture” appeared on the scene. “Venture” was of larch on oak timbers and copper bottomed, suggesting the best of the Highland fir had been used up. On the day the “Venture” was launched, John Duncan launched the “Ajax” a 180 ton steam tug which was towed south for boilers and engine to be installed – this was the first steam boat built at Speymouth. The newly developed Aberdeen Bow which reduced the measured tonnage of a ship and so the port charges was first built into a Speyside ship in the “Margaret Edward” which was launched in 1856. The Spey had moved west by 1860 and was threatening housing in Kingston, so a cut was made through the shingle bank to open a new mouth west of Tugnet. The first ship to sail out through the newly opened mouth was the three masted schooner of 184 tons, “Agnes Jessie”, built by John Duncan and thereafter shipbuilding in Speyside cracked on apace with larger ships being built on into the 80s. Like every other place where ships have been built, there were accidents and deaths. Wooden merchant shipbuilding was diminishing and in 1878 Spence’s last ship a 157 schooner, the “Mary Jane” was launched; in 1882 John Duncan’s final ship launched was a 99 ton schooner “Mabel” although he did continue to build fishing boats. William Anderson took up business in 1884 and built two schooners, “Flora Emily” and “Racer” for which he had to wait 4 years for a buyer. After the launch of “Janet Storm” in 1890 orders were not forthcoming and large shipbuilding at Spey largely came to a halt. However, in 1920 Thomas Duncan launched a 30 foot fishing vessel named the “Fidelity” and the author of the book I am reviewing, a small sloop in 1970 followed in 1992 by the “Success” a small two master schooner. Chapter six describes present day Speymouth and what remains to be seen from the key shipbuilding years. The only evidence of the seven shipyards which once stood there are a few concrete foundations of the Kinloch yard at Kingston. Of course the shipwrights houses and Red Corff House are still very much as they were at the time. The author carefully explains several features of the yards and infrastructure which can be made out, or the sites identified with other buildings on them, if you are in the know. The new names of houses and their associations with the important shipbuilding figures are detailed in this chapter along with the sites of businesses which would have worked in tandem with them, such as the smiddy. I would expect that this chapter in particular would be a treasure trove for anyone with an interest in learning more of the history of Kingston and Garmouth. A fascinating gem of a book from both shipbuilding and Speysiders’ perspectives. Thank you Andrea! 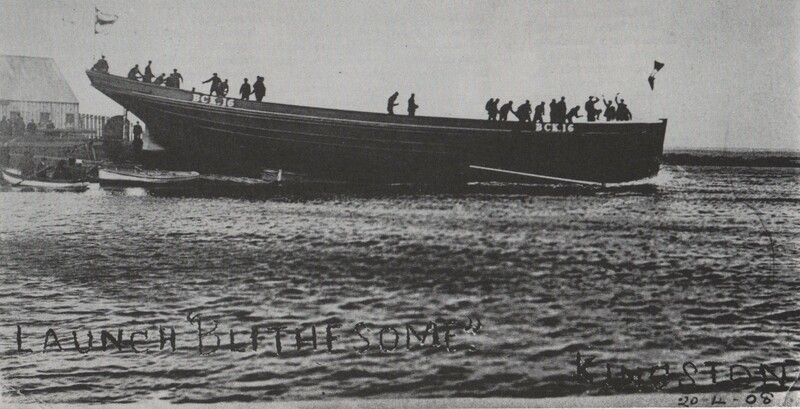 This entry was posted in British Shipbuilding, Scottish Shipbuilding, Scottish Shipyards, Shipbuilding, Shipyards, Speyside and tagged Aberdeen Bow, Abraham Newlands, Admiral, Agnes Jessie, Ajax, Alexander Leslie, Alexander Young, Annual Tonnages built at Speymouth, Blythsome, book review, Britannia, Cairngorm Canoeing and Sailing School, canoeing the length of the Spey, Captain John Mason, Charles II, Clive Freshwater, coastguard, Craigellachie Bridge, Dodsworth and Osborne, Duke of Gordon, Fidelity, first steam boat built at Speymouth, fishing boats, Five Friends, Flora Emily, Fochabers, Forestry Department of Aberdeen University, former Osborne employee, Garmouth, Geddie family, Glenmore Company, Glenmore Forest, Graeme Nairn, Handsome, Hastings, Highland fir, Highlander, Industry, Isabella, J. Geddie; Geddie’s yard, Jacobite Rebellion, James Duncan, James Duncan of Kingston, James Winchester, Janet Storm, Jim Skelton, John Badenoch, John Barrie, John Duncan, Johns, Kingston, Kingston Port, Kingston Upon Hull, Kinloch yard, Lady Jane, largest smack in Scotland, Leslie and Co, List of Speybuilt ships, Logie, Maiden Tree of Glenmore, Margaret Edward, Mary Jane, Moray District Council, Morayshire Directory, Mr Falconer, Muckle Spate, Peterhead, Pinus Sylvestris, Principal Shipbuilders of Speymouth, Racer, Red Corff House, Rosedale, schooner, Scotland’s first vessel fitted for gutting at sea, Scots Pine, shipping, Shipyards, Shoreham, Sir Ludovic Grant, sloop, Spey fir, Spey timber, Speybuilt, Speymouth, Speymouth Parish, Speyside, steam tug, Success, The English Company, the story of a forgotten industry, Thomas Telford, Tugnet, Two Sisters, Venture, William, William Anderson, William Geddie, Winsome, York Building Company. Bookmark the permalink. hi i have just read this bit of information and its helped me my great x 2 grandfather was a seaman on the sail schooner the Janet Storm and he was lost at sea on the schooner 19th oct 1892 during a major storm believed to been of the coast of the bell rock lighthouse i wonder if you had any pictures of the schooner as i have alot of info but not much else i hope you can help. Ive put your comment onto the blog in case anyone else should have some information to share with you, and have also asked my friend who lent me the book if she could see if there’s a picture of the Janet Storm she could copy to you for your research. Good luck with your hunt. Was there a ship built there called the ‘Garmouth’? It was lost as sea in the Bay of Biscay between Gipa and Valencia about 1 November 1879 while carrying a cargo of coal. I am looking for a photo of the ‘Garmouth’. I don’t know but will email my friend who loaned me the book and ask her to have a look so I can get back to you on that one. Back in the day (around 1885), my great grandfather David was half owner of the wooden barquentine ‘Annie Bow’, operating out of Timaru, New Zealand. At the time, it was (I believe) registered in Sydney (Australia). It weighed 257 tons, and was built in 1869, at Garmouth on the River Spey; by shipbuilders Spence. A member of the Spence clan (Margaret) married James Geddie (perhaps a son of William – see above), and they produced a son John ( http://en.wikipedia.org/wiki/John_Geddie_%28journalist%29). There’s probably no way of knowing whether my great grandfather David (Gedye) knew of the similarity of names – our family name comes from Cornwall – but it’s fun to think that it is more than a coincidence – the celtic connection was there all along. Here I am, a Geddie descendent 🤗 I have my DNA and a tree on Ancestry. I inherited the book “The Families Geddie & McPhail” My great grandmother was Elizabeth Geddie from the Alabama line. Good genes too, she lived to be 96 years old. I knew her well. I have been browsing through this site and notice you have a question about your 5x times great grandfather William Geddie shipbuilder in kingston. I have his name in my family tree and William Geddie was married to Ann Laing. They were the parents of Mary Geddie who was born 7th January 1811 and Mary married my 3x times great uncle John Duncan who was also shipbuilder at kingston port. They were married on 7th January 1832. Ann passed away at age 68 yrs on 30th December 1879. If this is of helps i can give you further info. Great to be able to help make connections! Not sure when you will get this, I forgot I had put a comment on and have just come across it. Your family is indeed related to mine, I did have most of that information and have added your 3x great uncle to my tree (hope that is OK), not sure how to swap emails on here but it would be great to get in touch. I am pleased you have added my 3x times grt uncle John Duncan ( ship builder)on your family tree. My 2xtimes great grandfather Alexander Duncan was ship carpenter and ships captain and Brother in law to Mary Geddie after her marriage to John Duncan . John and Mary was the aunt and uncle of my great grandmother Isabella Duncan. And she was cousin of Mary Geddie and John Duncan’s children. In my family tree documents my 2x times great grandfather Alexander Duncan sign’s the death certificate of John Duncan. I have a long long history dating back to the 1700’s of Duncan and Geddie And how the Geddie’s became intertwined in my family tree. My 3x times great grand parents were the grandparents of John and Mary’s children down the Duncan side of the family . My 3x times great grandfather was William Duncan. In the 1700’s the Duncan family were farmers at Mathew Mill around the Moray area. My 3 x times grand parents came to Dumferlime house here in kingston for a period of time which i think would have been known as Corff or Korrf house back in that time and where the Duncan sons started out on the shipbuilding industry .their shipyard was directly opposite the front of Dumferline house .i am not sure of the exact spot where the Geddie’s had their shipyard . I have paper work of all the ships built by John Duncan and of William and George Geddie. This has been my 4th attempt today as all the info i put in for you has escaped or swiped off . Sue i think we need to get in touch to go down this lengthy family tree of Duncan / Geddie and history of the ship building yards here at kingston. I have sent 2 of Jim Skelton’s books to descendant cousins in the family tree living in America who i searched for 30 years and eventually found them a year ago. It is a very sad story that one , they were the great niece and nephew’s of Mary geddie and John Duncan. I hope i do not lose sight of this one so i will try to send again and sincerely hope Sue that you will get this message direct. I leave my mob numb for you to get in touch so we can can journey through the history of our ancestors. June, I thought John Duncan’s parents were James Duncan & Isabel Mackenzie & that he was born in Matthewmill 18 10 1806. James Duncan’s parents were Robert Duncan & Anne Roy. 3x g,g,Grandfather William Duncan ??? Thanks so much Ruth ,very grateful to you for getting myself and Sue together.